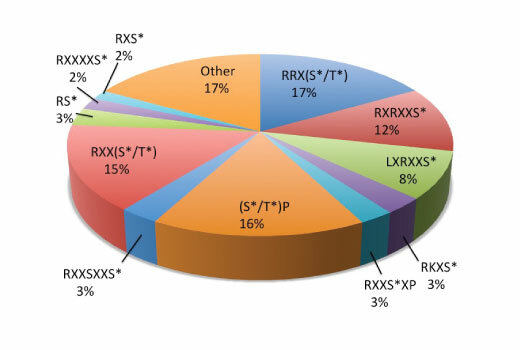 This chart shows the underlying motif ditribution in a PhosphoScan® LC-MS/MS experiment using 1526 nonredundant Lys-C digested peptides generated from mouse embryo and immunoprecipitated using PTMScan® Basophilic Kinase Motif [(R/X)(R/X)Xp(S/T)] Immunoaffinity Beads. Phospho-threonine peptides comprised 17% of peptides in this data set while phospho-serine contributed 83%. The Motif Logo was generated from a PhosphoScan® LC-MS/MS experiment using 1526 nonredundant Lys-C digested peptides derived from mouse embryo immunoprecipitated with PTMScan® Basophilic Kinase Motif [(R/X)(R/X)Xp(S/T)] Immunoaffinity Beads. 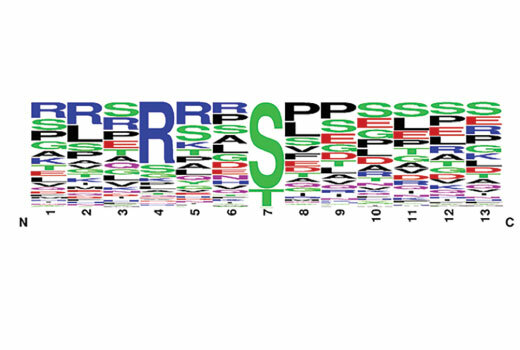 The logo represents the relative frequency of amino acids in each position surrounding the central phosphorylated residue. As an integral part of the machinery of cellular function, proteins undergo regulation by a variety of post-translational modifications. One of the most prevalent and widely studied PTMs is serine/threonine phosphorylation. Prominent kinases targeting consensus substrate motifs account for tens of thousands of known and predicted sites on more than 13,000 human proteins (1-3). Cell Signaling Technology has developed phospho-Ser/Thr motif antibodies for proteomic profiling of kinase substrates. Arg-directed or AGC-family kinases including PKA, PKG, PKC, Akt, p70 S6 kinase, AMPK, and RSK and are characterized by preference for basic amino acids (Lys or Arg) especially Arg at position -3 relative to the phosphorylated Ser or Thr (1,4). Akt, p70S6 kinase and RSK additionally share specificity for Lys or Arg at position -5 (5). CST™ has developed a Basophilic PTMScan® kit comprising a pool of antibodies that recognize basophilic kinase substrate motifs as a powerful proteomics analysis tool for investigating the regulation of phosphorylation by Arg-directed kinases, as well as for high throughput kinase drug discovery.